Fabric interfaces allow users to interact with computers in new ways. Imagine sitting in front of a “Choose Your Own Adventure” tale. It’s just like the book format that you might remember from childhood, but instead of being on a page, it unfolds on the screen. You read through several paragraphs of text, and are presented with four colorful options to shift the direction of the story. Here’s the magical part: You select your preferred option by passing a certain color thread through a loom. That’s right—this game is loom-controlled. When most people think of interacting with computers, they think of traditional interfaces, like a computer mouse, keyboard, or cellphone. However, as computer capabilities evolve, so do the variety of interfaces. One intriguing and nontraditional idea is to use fabric-based interfaces for fun or to achieve a goal. Because all of us are familiar with fabric as a material, the systems also aim to be more inclusive. 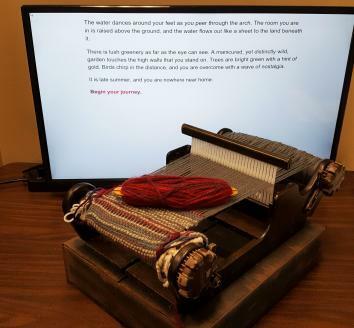 One version of a cloth-based computer interface is a video game system called Loominary, which uses a tabletop loom as an interface to weave a scarf using a narrative videogame that follows the story of the Greek myths of Oedipus and Medusa (or a more child-friendly version with a story about a unicorn). Here’s how it works. The yarn is loaded onto sticks called shuttles to pass it through the loom, and a computer tracks the movement of these shuttles using radio frequency identification (RFID) devices and integrating them into the mechanics of the loom. The sensing equipment to allow a computer to read the movements of the RFID cards is hidden under the loom in a box. To figure out the technology McCoy had the help of Sarah Hendricks, who worked on how to track the weaving as part of her undergraduate capstone project. McCoy came up with the idea for the loom along with Anne Sullivan, a digital media professor at the University of Central Florida whose background is in crafting. They wanted to leave users with a tangible product once completed. The duo also worked with master’s student Bri Williams write the story in a program called Twine that allows users to create a branching story. “When you beat a boss in a game, you have a unique story of how you got through it, and that tends to be what you kind of share with your friends. It’s not the story about the game, it’s what you did in the game,” Sullivan said. “The problem is that a lot of games don’t capture that in any way, and so the inspiration for Loominary was … ‘How can we capture their story in a more tangible way?’ ” Sullivan said. The makers hope that the game system will simultaneously appeal to both gamers who might be intrigued by the unusual interface and crafters who might not normally be attracted to video games. Crafting and computing have traditionally been viewed as disparate activities, but as Future Tense has explored before, one can easily inform the other. A movement known as computational crafting also blends the two disciplines. Sullivan and McCoy hope that others will take the concept and develop it further. Loominary’s code and instructions are open source, which means that users can build their own versions, modifying the story as they desire. While both professors are interested in incorporating other crafts into future games, they also both plan to develop Loominary in different ways. McCoy wonders about the possibility of using artificial intelligence to generate a dynamic story each time rather than a static one, and Sullivan can also see incorporating other scarf references in pop culture into the gameplay (Harry Potter house scarf, anyone?). While Loominary is unique, others have also experimented with fabric interface functions. As my fellow Slate intern Lisa Fierstein first brought to my attention, Sean Ahlquist, an architecture professor at the University of Michigan, has created a large, flexible, fabric-based version of a touchscreen. Using an industrial-sized knitting machine, he makes large pieces of specially strengthened fabric that respond to the amount of pressure applied to them. It uses a combination of Microsoft Kinect software (which registers movement) and custom software that ties these changes in movement with changes in the fabric surface. Social Sensory Surfaces Research Project from Sean Ahlquist on Vimeo. Ahlquist has developed two versions of the textile interface, which he currently intends to be used primarily by children with autism. (He was inspired by his daughter, who has autism.) In “Stretch Color,” the sensitive fabric is stretched out to resemble a large projection screen and serves as a high-tech coloring book. Unlike the typical projector screen, however, the images on the fabric respond to touch, allowing children to color in the designs by applying the correct amount of pressure. This helps children with autism learn how much force to apply to their gestures, something they sometimes struggle to do. In “Stretch Play,” the same knit fabric is stretched out on a much more unusual frame, creating tunnels and structures that users can climb under and through. The programming for this interface triggers certain animations when specific spots on the structure are touched. Touching one spot might cause fish to appear and follow your movements, for example. Ahlquist designed the structure so that children could not easily trigger all of the functions simultaneously—they must work together to simultaneously trigger patterns for more interesting effects. Stretch|PLAY from Sean Ahlquist on Vimeo. Although Loominary and Ahlquist’s projects have vastly different purposes—, they both integrate technologies and materials that seem familiar in other contexts and combine them in ways that are novel and intriguing. I, for one, wouldn’t mind if we were able to weave these ideas into daily life in the future.